Are you running on the hamster wheel of life? Trapped in a maze of responsibility? Up to your eyeballs in stress? Whether you are a corporate executive, busy mom or active retiree, the demands of daily living are undeniable. Even if you are here on vacation, sometimes that foreboding sense of obligation tags along. Fortunately, your escape route is shorter than you think. The Lowcountry is an oasis of relief, featuring large hotel-based spas, medical spas, salon spas and intimate day spas, each offering an inviting menu of services to pamper the body, calm the mind and soothe the spirit. Just what the doctor ordered, right? Once considered a luxury, in recent years, spa visits have become less about indulgence and more about healthy lifestyles. Medical research suggests that relaxation (the cornerstone of the spa industry) is an important key to health. It is the antidote to stress, which is known to cause and/or exacerbate a number of physical illnesses, including heart disease, digestive disorders, skin conditions, sleep disturbances, autoimmune diseases, depression, obesity, and more. According to the Mayo Clinic, relaxation can reduce stress symptoms by slowing the heart rate, lowering blood pressure, slowing the breathing rate, increasing blood flow to major muscles, reducing muscle tension and chronic pain, reducing anger and frustration, and boosting confidence. As a result, many people experience more energy, better sleep, enhanced immunity, increased concentration, better problem-solving abilities, greater efficiency, more balanced emotions, fewer headaches and less pain. The good news is you can get all these benefits at your local spa—no prescription required! Spa use is increasingly recognized as a viable solution to stress-related health problems. In a study of more than 3,300 Japanese government workers, frequency of spa use was linked to better physical and mental health, including better quality sleep and fewer sick days. In a similar study conducted by researchers from Florida State University and George Mason University, spa therapy reduced both absenteeism from work and hospitalizations. In addition to the opportunity to take a deep breath and relax, most spa treatments involve being touched, another key element of both physical and emotional health. According to a report in Psychosomatic Medicine, touch (the non-sexual, supportive kind) lowers stress hormones and blood pressure while also enhancing oxytocin, a hormone thought to calm and counter stress. Whether you are looking for pain relief, wrinkle reduction, softer, smoother skin, a set of luxurious lashes or something as simple as a sassy new nail color, you’re a hop, skip and jump away from your day of bliss. Area spas provide a smorgasbord of services, from high tech to holistic, including a wide range of traditional therapies with a surprising array of benefits. For example, massages stretch the muscles, aid joint mobility and improve circulation. 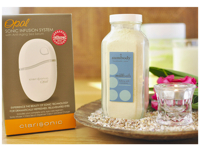 Body scrubs, wraps and masks exfoliate, detoxify and hydrate the skin. 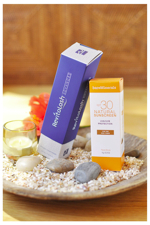 Facials cleanse the skin, hydrate and stimulate the production of new cells. Most facials also include head and shoulder massage to relieve tension. Stones are utilized in many treatments to restore energy and vitality, relax muscles, ease tension and increase circulation. Reflexology is type of massage that can be performed on your hands or more commonly your feet that has healing effects throughout the body. Aromatherapy is used to invigorate, calm and relieve stress as well as stimulate the immune system, circulatory system and nervous system. In addition to the latest therapeutic and curative treatments, you’ll discover a variety of beauty treatments including bikini and brow waxing, luxurious pedicures, no-chip manicures and glamorous lash extensions. Many spas also have physicians and licensed technicians on hand to perform services such as facial fillers, injectables, laser treatments, chemical peels, microdermabrasion and other anti-aging treatments. While services that involve hot wax or needles don’t necessarily qualify as “relaxing,” they are, nevertheless, an important part of a healthy self-care routine that enhances self-esteem and boosts confidence. Whatever service you choose, studies suggest that the real value lies not in the treatment itself, but in the feeling of being pampered that is universal to the spa experience. 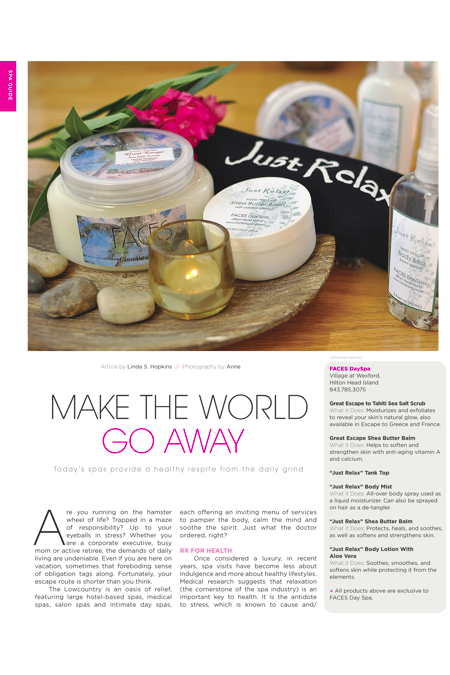 So, put your favorite spa on speed dial and blast off regularly to a place of serenity and calm. You may not be able to make the world go away, but you can certainly beam up long enough to relax and rejuvenate before duty calls you back down to earth. What it Does: Moisturizes and exfoliates to reveal your skin’s natural glow, also available in Escape to Greece and France. What it Does: Helps to soften and strengthen skin with anti-aging vitamin A and calcium. What it Does: All-over body spray used as a liquid moisturizer. Can also be sprayed on hair as a de-tangler. What it Does: Protects, heals, and soothes, as well as softens and strengthens skin. What it Does: Soothes, smoothes, and softens skin while protecting it from the elements. 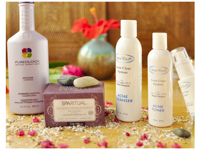 All products above are exclusive to FACES Day Spa. What It is: A conditioner applied once daily to your eyelashes before bedtime. Created by a doctor whose wife had undergone chemotherapy and had fragile, sparse and thin lashes as a result. What it Does: Protects against sunburn with a light, non-greasy formula. What It Does: Instantly hydrates, smoothes, and brightens eyes. Results last for hours and benefits improve over time. What it Does: The be-all, end-all milk bath dream made with buttermilk, cream, coconut milk, and yogurt. Milk- it does a body good. What it Does: A soy candle blended with tea olive spiked with lemon and lime, white grapefruit, and peach. What It Does: Burns cleanly (no black soot), smelling like fresh mangoes from Hawaii. What it Does: This non-invasive toning device delivers low-level electrical micro current impulses to strategic locations on the face to improve facial tone for a more youthful appearance. For use with NuFace Derma Gel & NuFace Optimizing Mist. What it Does: Envelopes you, fresh from a bath or shower. What It Does: Changes color to reflect your level of exposure to the sun. What it Does: Removes 81 calories of dietary fat per day. What it Does: Ads moisture to skin as needed. What It Does: Significantly reduces the appearance of fine lines and wrinkles while increasing firmness and improving clarity, leaving skin smooth and youthful-looking. What it Does: Patented age-reversing treatment reveals a brighter, more youthful look. Humectants and lipids infuse essential moisture into the delicate eye area. What it Does: Exfoliating cleanser revitalizes skin by polishing away dullness. What it Does: Patented, scientifically-proven formula improves skin elasticity and skin texture overnight. What it Does: Patented formula replenishes vital lipids and creates an invisible barrier to lock in moisture. What it Does: Locks in optimal moisture levels for 8 hours and restores resilience as well as tone of skin. What It is: Hydrating shampoo for color-treated hair. What it Does: Gently exfoliates while awakening skin. What it Does: Cleanses and removes excessive oil and bacteria from skin. What it Does: Helps remove any bacteria and oil residue after cleansing. What it Does: Extracts calm the skin while providing needed moisture. Between spa visits, consider creating a spa-like environment in your own home—a private sanctuary where you can escape the pressures of the day. Before you begin, visit your favorite spa, and make note of the reasons you love being there. Is it the soothing colors of the walls? Soft lighting? Pleasant scents? Relaxing music? Cushy chairs and fluffy throw pillows? Notice how all of the elements work together to create a sense of harmony, and think how you might recreate the same atmosphere at home. The secret is to indulge your senses. If your immediate future does not include a major home-improvement project, make the most of what you already have. Chances are you have a bathtub, and that’s a good start. There’s just something about a relaxing soak that can help melt your troubles away. Just say no to harsh florescence in your bathroom. To create a sense of calm and soothe your sense of sight, use natural light from the outdoors by adding windows or skylights. Install dimmers on all other lighting fixtures. If you like to read while you soak, consider adding a wall sconce light or a directed spotlight. Further enhance your spa ambiance with an array of candles, from tall pillars to tiny votives. Choose scented candles for a whiff of calm. Excite your sense of touch with a variety of textures, such as loofah, mesh body scrubbers, body brushes and pumice stones. Silken water and soften your skin with fragrant oils and bath salts. Delight your palate with a refreshing drink. (Purchase some pretty acrylic drinking glasses for safety’s sake.) If the side of your tub isn’t wide enough to accommodate your favorite libation, purchase a bathtub caddy. Many feature candle holders, wine glass holders, book stands and miscellaneous compartments for your spa products and tub toys. 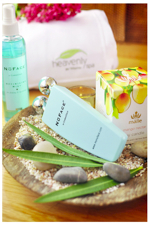 Of course, you want to stock your spa with the most indulgent skincare products available. Bath and body shops are good sources as are professional spas. When you are ready to emerge from your bath, give your senses the ultimate thrill by wrapping up in a luxurious Turkish towel. Keep your skin soft and hydrated with moisturizing body sprays and rich lotions and creams, scented or not. Then step into a silky gown, your favorite PJs or a soft, fluffy robe and comfy pair of slippers. Go ahead and escape. The world will still be here when you’re ready for re-entry, and you’ll be better equipped for the next trip around the sun. WELCOME TO THE ART OF MASSAGE- A GREEN WELLNESS SPA! THINK OF YOUR TIME HERE LIKE A CANVAS. IT BEGINS BLANK, AND EVERY TREATMENT IS ANOTHER BRUSH STROKE. DIFFERENT TOOLS ARE USED AND WE ALL HAVE DIFFERENT TASTES, BUT YOU WILL PUT THE FINAL SIGNATURE ON! WE HAVE SIMPLE, AFFORDABLE TREATMENTS USING NATURAL AND ORGANIC PRODUCTS THAT ALLOW YOU TO CUSTOMIZE YOUR EXPERIENCE HERE. MIX AND MATCH TO CREATE YOUR ONE-OF-A-KIND MASTER-“PEACE”! COMBINES THE BEST OF BOTH WORLDS – WARM BAMBOO STICKS AND WARM RIVER STONES COMBINE TO GIVE YOU SOOTHING HEAT AND A DEEP TISSUE MASSAGE. THIS DEEP CLEANSING TREATMENT INCLUDES THE ENZYME PEEL AND IS THE BASIC MONTHLY MAINTENANCE NECESSARY TO KEEP SKIN LOOKING AND FEELING ITS BEST! 90 MIN. SESSIONS ARE ALSO OFFERED WITH MORE PERSONALIZED SERVICES FOR $135. A CUSTOMIZED SIGNATURE MASSAGETO MEET THE INDIVIDUAL NEEDS OF THE CLIENT, INCLUDING KRIYA, RELAXATION, DEEP TISSUE AND REFLEXOLOGY ALL INCLUDED IN THE 1-HOUR TREATMENT, FOLLOWED BY AN ANTI AGING FACIAL USING ONLY PURE ORGANIC PRODUCTS THAT WILL NOT HARM THE SKIN. ORGANIC CHAMOMILE OIL IS USED FOR THE MOST SENSITIVE SKIN. GOJI BERRY MASK, HIGH IN VITAMIN C AND ANTIOXIDANTS TO NOURISH THE SKIN, REDUCES PUFFINESS AND DARK CIRCLES AROUND THE EYES AND TONES, FIRMS AND IMPORVES THE TREATMENT OF THE SKIN ALL IN ONE TREATMENT. A LUXURIOUS THERAPEUTIC TREATMENT WHICH PURIFIES AND CLEANSES THE ENTIRE BODY, USING HIMALAYAN SALTS TO REFRESH THE FEET, WARMED AROMATIC OILS, AND HOT MUSLIN BAGS OF FRAGRANT HERBS TO MASSAGE THE BODY. THIS TREATMENT WILL MELT AWAY TENSION, SOFTEN THE SKIN, AND INDUCE DEEP REST. 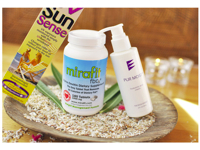 BEAT THE HEAT AND LOOK YOUR BEST BEACH-SELF WITH OUR BEACH READY BABE PACKAGE. GET READY FOR FUN IN THE SUN, FEATURING OUR LUSCIOUSLASH EXTENSIONS, NO-CHIP MANICURE AND PEDICURE, BIKINI WAX, AND SUNSATIONAL SPRAY TAN. CHOOSE ANY 3 OF THE 5 SERVICES AND RECEIVE 10% OFF OF THIS EXCLUSIVE PACKAGE, BROUGHT TO YOU BY FACES DAYSPA. EXCLUSIVE TO THE HEAVENLY SPAS, THIS UNIQUE TREATMENT PUTS A NEW SPIN ON HOT STONE MASSAGE. HEATED CRYSTALLINE SPHERES ARE ROLLED OVER THE BODY, MELTING AWAY TENSION AND RELAXING TIGHT MUSCLES, WHILE RESTORING BALANCE. TITAN LASER TREATMENT IS QUICKLY BECOMING A POPULAR CHOICE FOR SAFELY TIGHTENING LOOSE OR SAGGING SKIN. A FACE-LIFT WITHOUT SURGERY – AND NO RECOVERY TIME! – THE TITAN LASER SHRINKS COLLAGEN, AND TIGHTENS AND LIFTS THE SKIN. LOOK YEARS YOUNGER AND EXPERIENCE THE NEWEST AND SAFEST WAY TO ACHIEVE AGE DEFYING SKIN-TIGHT RESULTS ON YOUR JAW LINE, NECK, UNDER-CHIN AND ABDOMEN. EXPERIENCE FIVE HOURS OF TOTAL RELAXATION AND PAMPERING, A FULL BODY MASSAGE, EUROPEAN FACIAL, THERAPEUTIC PEDICURE, PARAFFIN FOOT TREATMENT, LUXURIOUS MANICURE WITH PARAFFIN HAND TREATMENT, HAIR CLEANSING, CONDITIONING AND BLOW DRY/STYLING. FINISHING WITH A LIGHT MAKE-UP APPLICATION. A SPA LUNCH AND BEVERAGE ADDS TO THE ENJOYMENT OF THIS SPECIAL PACKAGE. A TRADITIONAL SWEDISH FULL-BODY MASSAGE PERFORMED AMONGST A TRANQUIL BACKGROUND ALLOWING FOR FULL RELAXATION. 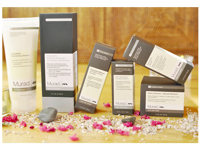 MASSAGE ENVY SPA’S NEW MURAD HEALTHY SKIN FACIALS FEATURE SPECIALLY FORMULATED PRODUCTS FROM WORLD-RENOWNED MURAD, INC. FOUNDER AND CEO DR. HOWARD MURAD HAS DEVOTED HIS LIFE TO MAKING BEAUTIFUL, HEALTHY SKINCARE PRODUCTS. FOUNDED IN 1989, THE MURAD SKINCARE LINE IS BASED ON SCIENCE-DRIVEN THE CELLULAR WATER PRINCIPLE®, WHICH CONCLUDES THAT OUR CELLS LOSE THE ABILITY TO RETAIN WATER AS WE AGE. MURAD PRODUCTS ARE DESIGNED TO REPAIR CELL MEMBRANES WHILE ATTRACTING WATER AND NUTRIENTS TO THE CELLS. THIS UNMATCHED MURAD APPROACH MAKES MASSAGE ENVY SPA’S MURAD HEALTHY SKIN FACIALS THE MOST EFFECTIVE WAY TO ACHIEVE BALANCED, MORE YOUTHFUL-LOOKING SKIN. RELAX AND ENJOY AS MILK FROM THE COCONUT IS GENTLY MASSAGED INTO THE SKIN FOR THE PREPARATION OF A GENTLE SUGAR EXFOLIATION, FOLLOWED BY 50 MINUTES OF CALMING SWEDISH MASSAGE. TO COMPLETE THE TREATMENT, PINEAPPLE INFUSED EXOTIC NUT OILS GIVE THE FRESH SKIN IDEAL SOFTNESS AND ELASTICITY. OUR LICENSED THERAPISTS CREATE CUSTOMIZED MASSAGE EXPERIENCES JUST FOR YOU. ADVANCED TRAINING ENABLES THERAPISTS TO PROVIDE TONIC FOR THE SOUL BY COMBINING MASSAGE TECHNIQUES WITH AN INTUITIVE APPROACH TO THE THERAPY. KRIYA MASSAGE, THE “CHOCOLATE CAKE” OF MASSAGE, IS A FULL BODY INTUITIVE MASSAGE THAT INCORPORATES ONE CONTINUOUS STROKE IN WHICH THE THERAPIST’S HANDS NEVER LEAVE THE BODY. OUR SIGNATURE FACIAL IS AN INTENSE, CORRECTIVE FACIAL SUITABLE FOR ANY SKIN TYPE AND AGE IT INCORPORATES THE USE OF EXFOLIATION, 2 DIFFERENT STIMULI, OXYGENATION, EXTRACTIONS, A RELAXING MASSAGE, WARM MITT HAND MASSAGE AND CUSTOMIZED MASK. UNLIKE MANY THERAPEUTIC FACIALS, SKIN LOOKS IMMEDIATELY SMOOTHER, FIRMER AND REVITALIZED. OUR SIGNATURE MASSAGE BOASTS 80 WONDERFUL MINUTES OF HOT STONES, WARM PARAFFIN, AROMATIC OILS AND SWEDISH MASSAGE TECHNIQUES, ALWAYS ADAPTED TO EACH CLIENT’S NEEDS IT IS PURE HEAVEN! ANOTHER HIGHLIGHTED TREATMENT IS IONITHERMIE, THE MOST EFFECTIVE WAY TO REMOVE CELLULITE. POPULAR ON BOARD CRUISE SHIPS AND IN EUROPE FOR OVER 25 YEARS, THIS WORKS! IN ADDITION WE OFFER INFINITY TANS, THE SPRAY TAN MOST POPULAR IN HOLLYWOOD AND KNOWN FOR ITS LACK OF ODOR AND STAINING, IN ADDITION TO LOOKING NATURAL AND LONG LASTING! ENERGY WORK THAT FLOWS TO THE AREAS IN NEED. SOOTHING PAIN AND SUPPORTING THE BODY’S NATURAL ABILITY TO HEAL ITSELF. ONE OF THE MOST POPULAR NON-SURGICAL PROCEDURES RIGHT NOW IS THE “LIQUID FACELIFT,” A SYNERGISTIC COMBINATION OF FACIAL INJECTABLES (SUCH AS BOTOX, JUVEDERM, RADIESSE, AND SCULPTRA) TO LIFT AREAS OF SAGGING, TO CORRECT HOLLOWNESS, AND TO REDUCE THE APPEARANCE OF WRINKLING. IN ESSENCE, LIQUID FACELIFT TECHNIQUES CAN BE USED TO RESTORE A MORE YOUTHFUL APPEARANCE, NO SCALPEL INVOLVED! FURTHER, PATIENTS LOVE THE FACT THAT THERE IS MINIMAL DOWNTIME AND EVERYDAY ACTIVITIES CAN BE RESUMED ALMOST IMMEDIATELY. WILD RICE AND MULBERRY SCRUB AND RUB. EXPERIENCE THE NATURAL BENEFITS AND EXFOLIATING PROPERTIES OF REGIONAL BOTANICALS. RINSE OFF YOUR SILKY SMOOTH SKIN IN ONE OF OUR CLAW-FOOTED PORCELAIN TUBS ON YOUR PRIVATE OUTDOOR VERANDA OVERLOOKING THE MARITIME FORESTS AND LAGOONS OF PALMETTO BLUFF. EMERGE FROM THE SOAK AND ONTO THE TABLE FOR A 60 OR 90 MINUTE, FULL BODY, CLASSIC MASSAGE. IT HAS BEEN FEATURED IN ALLURE MAGAZINE’S “BEST OF” ISSUE, AS WELL AS TWICE ON “THE DOCTORS”, A CBS TELEVISION SHOW. THE HYDRAFACIAL IS A FAVORITE AMONG CELEBRITIES TO GET THEIR SKIN “RED CARPET” READY! SAFE FOR ALL SKIN TYPES FEATURING HYDRATING EXFOLIATION AND PAINLESS EXTRACTIONS COMPLETED WITH A CUSTOMIZED INFUSION MASK. FOR MAXIMUM BENEFIT A SERIES OF SIX IS RECOMMENDED. THE MOST POPULAR BODY TREATMENT IS THE LIPOLASER BODY CONTOURING TREATMENT. FEATURED ON “FOX NEWS”, IT’S EFFECTIVE TECHNOLOGY IS A PAINLESS, NON-INVASIVE WAY TO SHAPE YOUR BODY AND/OR REDUCE STUBBORN AREAS OF FAT.